Mercury is an incredibly stubborn toxin. Once it is emitted from the smokestacks of coal-fired power plants, among other sources, the gas can drift through the atmosphere for up to a year before settling into oceans and lakes. It can then accumulate in fish as toxic methylmercury, and eventually harm the people who consume the fish. What's more, mercury that was previously emitted can actually re-enter the atmosphere through evaporation. These "legacy emissions" can drift and be deposited elsewhere, setting off a cycle in which a growing pool of toxic mercury can circulate and contaminate the environment for decades or even centuries. A new MIT study finds that the longer countries wait to reduce mercury emissions, the more legacy emissions will accumulate in the environment, and the less effective any emissions-reducing policies will be when they are eventually implemented. In a paper published in the journal Environmental Science and Technology, researchers have found that, for every five years that countries delay in cutting mercury emissions, the impact of any policy measures will be reduced by 14 percent on average. In other words, for every five years that countries wait to reduce mercury emissions, they will have to implement policies that are 14 percent more stringent in order to meet the same reduction goals. The researchers also found that remote regions are likely to suffer most from any delay in mercury controls. Mercury contamination in these regions will only increase, mostly from the buildup of legacy emissions that have traveled there and continue to cycle through and contaminate their environments. "The overall message is that we need to take action quickly," says study author Noelle Selin, associate professor in MIT's Institute for Data Systems and Society and Department of Earth, Atmospheric, and Planetary Sciences. "We will be dealing with mercury for a long time, but we could be dealing with a lot more of it the longer we delay controls." The Minamata Convention, an international treaty with 101 parties including the United States, went into effect in August 2017. The treaty represents a global commitment to protect human health and the environment by reducing emissions of mercury from anthropogenic sources. The treaty requires that countries control emissions from specific sources, such as coal-fired power plants, which account for about a quarter of the world's mercury emissions. Other sources addressed by the treaty include mercury used in artisanal and small-scale gold mining, nonferrous metals production, and cement production. In drafting and evaluating their emissions-reducing plans, policymakers typically use models to simulate the amount of mercury that would remain in the atmosphere if certain measures were taken to reduce emissions at their source. But Selin says many of these models either do not account for legacy emissions or they assume that these emissions are constant from year to year. These measures also do not take effect immediately—the treaty urges that countries take action as soon as possible, but its requirements for controlling existing sources such as coal-fired power plants allow for up to a 10-year delay. "What many models usually don't take into account is that anthropogenic emissions are feeding future legacy emissions," Selin says. "So today's anthropogenic emissions are tomorrow's legacy emissions." 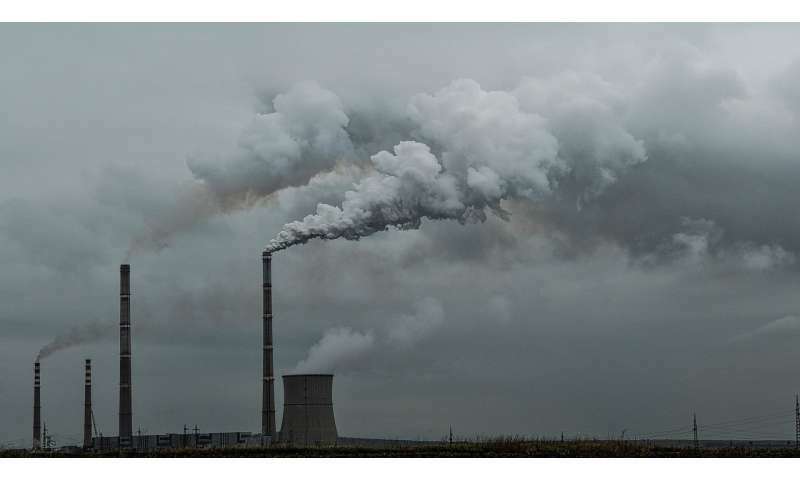 The researchers suspected that, if countries hold off on implementing their emissions control plans, this could result in the growth of not just primary emissions from smokestacks, but also legacy emissions that made it back into the atmosphere a second time. "In real life, when countries say, 'we want to reduce emissions,' it usually takes many years before they actually do," says Hélène Angot, the study's first author and a former postdoc at MIT. "We wanted to ask, what are the consequences of delaying action when you take legacy emissions into account." The group used a combination of two models: GEOS-Chem, a global atmospheric model developed at MIT that simulates the transport of chemicals in the atmosphere around the world; and a biogeochemical cycle model that simulates the way mercury circulates in compartments representing global atmosphere, soil, and water. With this modeling combination, the researchers estimated the amount of legacy emissions that would be produced in any region of the world, given various emissions-reducing policy timelines. They assumed a scenario in which countries would adopt a policy to reduce global mercury emissions by 50 percent compared to 2010 levels. They then simulated the amount of mercury that would be deposited in lakes and oceans, both from primary and legacy emissions, if such a policy were delayed every five years, from 2020 to 2050. In sum, they found that if countries were to delay by five, 10, or 15 years, any policy they would implement would have 14, 28, or 42 percent less of an impact, respectively, than if that same policy were put in place immediately. "The longer we wait, the longer it will take to get to safe levels of contamination," Angot says. Based on their simulations, the researchers compared four regions located at various distances from anthropogenic sources: remote areas of eastern Maine; Ahmedabad, one of the largest cities in India, located near two coal-fired power plants; Shanghai, China's biggest city, which has elevated atmospheric mercury concentrations; and an area of the Southern Pacific known for its tuna fisheries. They found that, proportionally, delays in mercury action had higher consequences in the regions that were farthest away from any anthropogenic source of mercury, such as eastern Maine—an area that is home to several Native American tribes whose livelihoods and culture depend in part on the local fish catches. Selin and Angot have been collaborating with members of these tribes, in a partnership that was established by MIT's Center for Environmental Health Sciences. "These communities are trying to go back to a more traditional way of life, and they want to eat more fish, but they're contaminated," Angot says. "So they asked us, 'When can we safely eat as much fish as we want? When can we assume that mercury concentrations will be low enough so we can eat fish regularly?'" To answer these questions, the team modeled the amount of fish contamination in eastern Maine that could arise from a buildup of legacy emissions if mercury-reducing policies are delayed. The researchers used a simple lake model, adapted and applied at MIT in collaboration with colleagues at Michigan Technological University, that simulates the way mercury circulates through a column that represents layers of the atmosphere, a lake, and the sediment beneath. The model also simulates the way mercury converts into methylmercury, its more toxic form that can bioaccumulate in fish. "In general, we found that the longer we wait to decrease global emissions, the longer it will take to get to safe methylmercury concentrations in fish," Angot says. "Basically, if you are far away [from any anthropogenic source of mercury], you rely on everyone else. All countries have to decrease emissions if you want to see a decrease in contamination in a very remote place. So that's why we need global action." The more money and time they waste on CO2 control the worse REAL pollution gets. REAL pollution kills millions of people every year. yeah. tuberculosis_boy and those industries, for whom you are a paid shill, are among the biggest contributors to the annual death toll.